Why are people in Seattle homeless? Every year in the weeks after the One Night Count of homelessness, surveyors head into King County’s shelters, camps and streets with clipboards and sleeves of socks to persuade a representative sample of homeless people to talk. They ask such things as where they’re from and their sexual orientation. They also ask homeless people to diagnose their houseless state, choosing from a range of causes, from eviction to mental illness to an argument with a family member. Years ago, this was a “check all that apply” question, said Peter Connery, vice president of Applied Survey Research, the California-based company that administers the survey for King County. 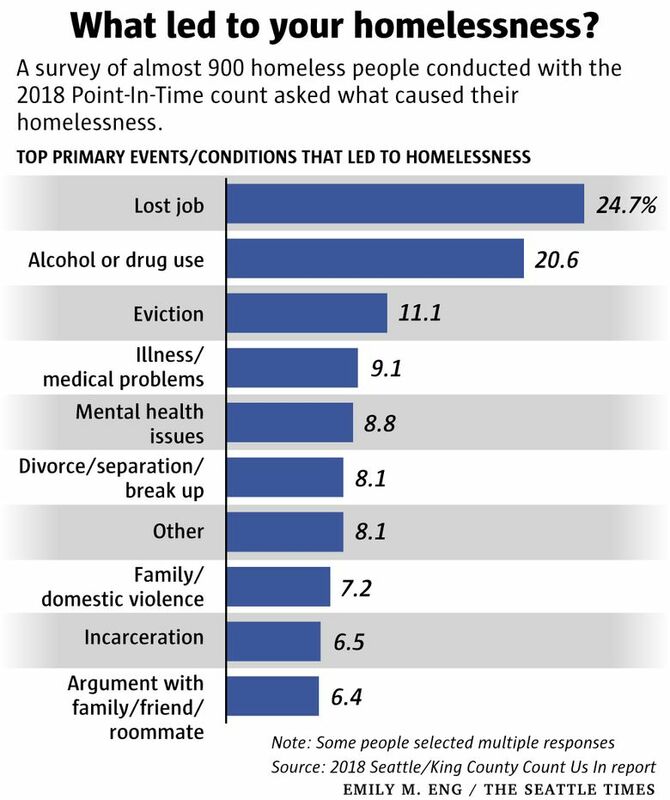 But that produced a “muddle” of answers, so they changed the question to, “What do you think is the primary event or condition that led to your homelessness?” The final bits of data are just now trickling in from this year’s survey, whose results will be released in May, Connery said. It’s a hard question even for homeless people to answer, but it’s also one researchers are exploring. That survey Connery oversees provides a simple but incomplete answer to that question, because no one is ever homeless for one reason. But when asked to pick, the biggest reasons people cited last year were losing a job, alcohol or drug addiction, and eviction. This question is often on students’ minds at Seattle Pacific University, where a local tent city is hosted on and off. 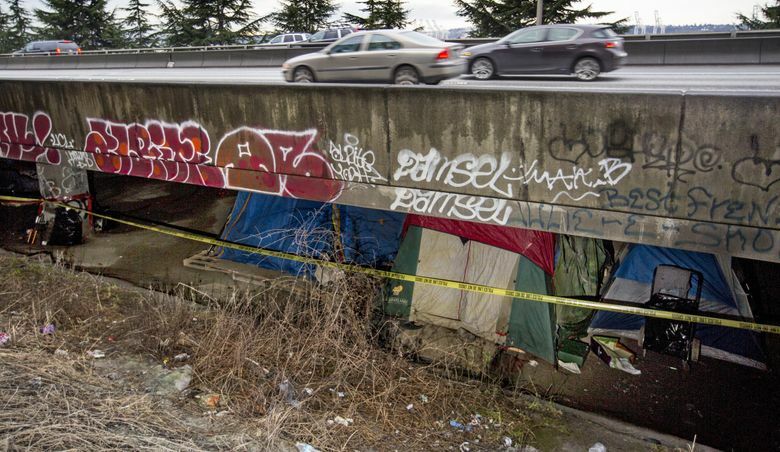 Karen Snedker, a sociologist at SPU who studies homeless camps, tries her best to answer it. “What I often tell my students is, there are different pathways — economics, housing, mental health, substance abuse — but the common denominator is poverty,” Snedker said. Adults who are homeless report higher rates of being homeless as a child, studies show. It’s not impossible for richer people to fall into homelessness, although wealth can help people weather these storms or move in with family. In Seattle, for instance, people with mental illness and drug dependency used to have somewhere to stay, in ultracheap places like the famous Ozark Hotel, a single-room-occupancy hotel on Westlake Avenue. Today, many of those rooming houses are gone. The Ozark burned down in 1970, and other hotels like it were deemed fire hazards and shut down. Combined with gentrification, an estimated 15,622 housing units disappeared in the downtown area between 1960 and 1980. They and other cheap housing were replaced over the next decades with much more expensive places to live in downtown. But the homeless people stayed. Researchers often look at homelessness more like a condition with risk factors, many of which go back to childhood. One study from Seattle released in 2002 found roughly half of homeless youth had been physically abused and almost a third had been sexually abused. Researchers can even predict homelessness by looking at some of these risk factors. Los Angeles’ Economic Roundtable looked at records of more than a million homeless people — nearly everyone who was homeless in L.A. County over 15 years — and tried to predict homelessness in an upcoming report. They found that risk of becoming consistently homeless is worse for single men, African-Americans, and workers in low-wage or inconsistent jobs with high turnover. Workers at temp agencies were the most at risk. The chance of becoming homeless gets worse if people lose a job when they’re older, at least up to 55. Around 8 percent of the working poor who lose a job in L.A. become persistently homeless, said Daniel Flaming, president of Economic Roundtable, a nonprofit think-tank. “These are people who’ve maybe been working-class people throughout their lives, and the economy leaves them behind,” Flaming said. When King County’s new homelessness survey comes out in May, systemic issues like poverty and childhood abuse won’t explicitly show up in the results. Homeless people, Snedker said, don’t often talk about those issues when they talk about homelessness; they usually talk about their own personal failings.